In need of a way to hang up your robe, an oven mitt, your car keys or the dog's leash? The 1-13/16 inch Single Prong Robe Hook is the perfect solution. It's small enough to fit in any space and allows you to store your items where you need them most. The 1-13/16 inch Double Prong Robe Hook is perfect for creating organization in small spaces. It can be used wherever you need additional storage capacity. And the attractive chrome finish easily blends into any style room. The 1-13/16 inch Double Prong Robe Hook is perfect for creating organization in small spaces. It can be used wherever you need additional storage capacity. And the attractive flat black finish easily blends into any style room. 1-13/16 in. Polished Brass Single Prong Robe Hook Organization with style has never been so easy. This metal hook is designed to hold a wide variety of items coats, hats, handbags, umbrellas, towels or robes. This classic design is perfectly suited for any room from the entryway to the bathroom. 1-13/16 in. 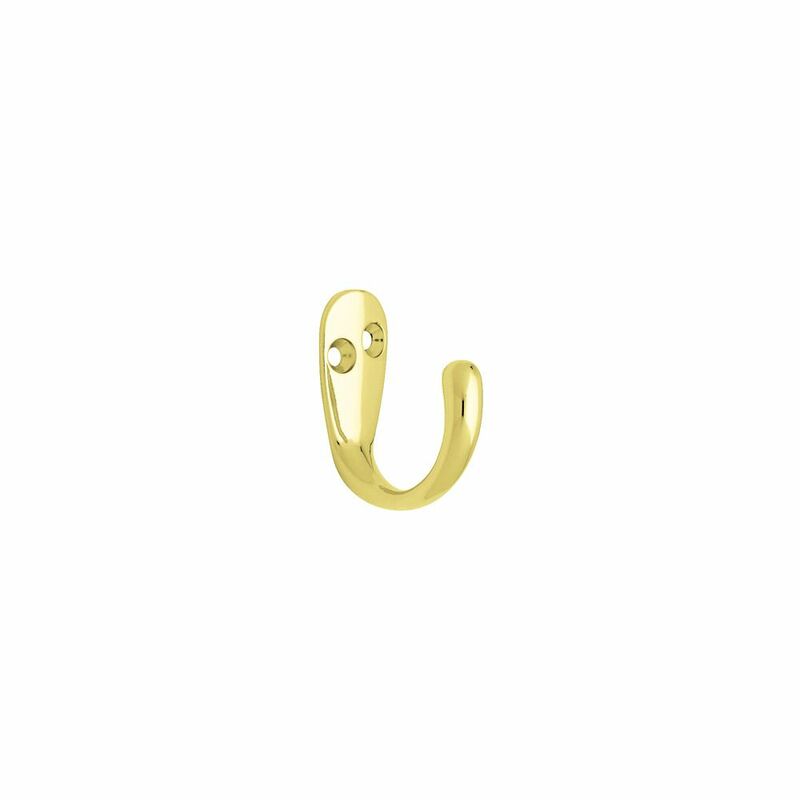 Polished Brass Single Prong Robe Hook is rated 4.6 out of 5 by 5. Rated 4 out of 5 by Harry from The hooks are fine. Ordered one pair in brass to... The hooks are fine. Ordered one pair in brass to use as window sash pulls(on the cheap) and a pair in white to hang a step stool in the closet. I was a hero for a day! Both came with decent matching screws. Pre-drill. Window is over the kitchen sink, so I waxed them first. Brass can get ugly. Rated 4 out of 5 by FAL14 from Just What We Wanted We used these on the Kitchen back splash to hang baking tools. They are of simple but elegant design. One screw was defective in ten units. We struggled with it for a bit before we looked and saw that there was a tiny bit of metal in the "x" on the head. Would have easily filed out but we never used the tenth hook so the point was moot.